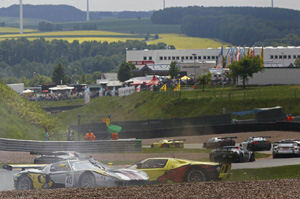 The fourth round of the 2011 FIA GT1 World Championship was held at the Sachsenring in Germany on the weekend of 14th and 15th May, 2011. 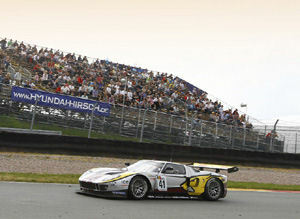 The No.41 Ford GT of driven by Martin and Makowiecki won the Qualifying Race. Victory in the Championship Race went to Hohenadel and Piccini in the No.4 Hexis Aston Martin DBR9. The Nissan GT-R's could not repeat their fabulous results of Portimão, finishing the Qualifying Race in positions 4 (No.20), 6 (No.22), 8 (No.21) and 11 (No.23) respectively. The Championship race turned out better for Sumo Power GT, with both cars finishing in 4th and 5th positions, while the JR Motorsports GT-R's still ended the race in the point in 7th and 9th positions. Victory in the Qualifying Race went to Frederic Makowiecki and Maxime Martin in the No.41 Marc VDS Racing Ford GT, who started the race in 14th position on the grid and stormed to the finish line with a margin of more than seven seconds. They were followed by the No.3 Hexis Aston Martin of Piccione and Dusseldorp in second and the No.8 Young Driver Aston Martin of Mücke and Turner in third. 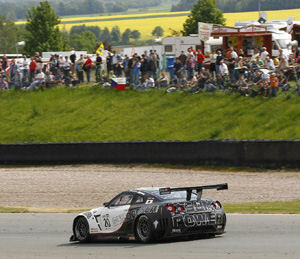 The pairing of Enrique Bernoldi and Warren Hughes, making his return for Sumo Power GT, finished first amongst the Nissans in fourth place to gain three championship points, whilst British duo Peter Dumbreck and Richard Westbrook, in the no.22 JR Motorsports, also grabbed a point for finishing in sixth. With its tight, twisting corners not suited to the Nissan GT-R's high centre of gravity, the Sachsenring was never going to suit the Nissans as well as the previous Algarve race track. In addition, after the two victories in Portugal, all four Nissans on the grid were encumbered with 30 lbs. (15 kg) worth of additional Balance of Performance weight, meaning that the eight drivers in the Nissan ranks had to battle extra hard in the Qualifying session to start the Qualifying Race in a creditable fourth (No.20), fifth (No.22), eighth (No.23) and 11th (No.21) positions. The classification was shuffled right at the start when a collision of the No.40 Marc VDS Ford GT and the No.9 Belgian Racing Ford GT brought out the pace car for the opening four laps. 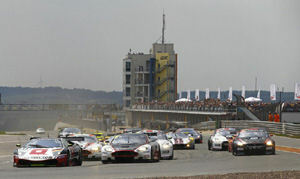 When the race restarted, the No.37 Lamborghini lead ahead of the No.3 Hexis and No.8 Young Driver Aston Martins. Thankfully none of the Nissans were affected by the opening collision, but there was movement amongst the field in the early seconds, with Dumbreck dropping a place to sixth in the No.22 JR Motorsports Nissan GT-R, and the No.23 JRM car being driven by Michael Krumm gaining a position to go into seventh. This, with Bernoldi's No.20 and Campbell-Walter's No.21 Sumo Power GT-R's remaining in their grid positions of fourth and 11th respectively, was how it stayed for the first quarter of the race, until the No.21 Sumo Power GT-R was passed to drop back to 12th, and the No.41 Marc VDS Ford GT, perfectly suited to the Sachsenring track, overtook the front running No.22 and No.23 JRM's in quick succession. After a remarkable opening stint, the No.41 Ford GT driven by Makowiecki had fought its way from 14th position on the starting grid to fifth when the pit stop window opened. The team then elected to stay out for a long first stint, and Makowiecki's pace, coupled with a rapid stop, allowed the team to just jump the No.3 Hexis Aston Martin of Stef Dusseldorp and Clivio Piccione for the lead. The Aston itself had benefited from a fantastic stop, but came out moments behind Maxime Martin in the No.41 Ford GT and, after one lap of heavy pressure, gradually lost ground to finish second. As the pit window opened, the GT-R's lay in fourth, seventh, eighth and 12th, but some truly excellent work from both teams' pit crews meant that the cars emerged after 35 minutes in third (No.20), fifth (No.22), seventh (No.23) and ninth (No.21). The No.23 JRM Nissan GT-R driven by Krumm was to fade in the second half of the race, with the additional 75 lbs (35 kg) ballast applied to the car after Portimão really taking its toll on the wear of the tyres. The leading the No.37 All-Inkl.com Lamborghini Murcielago lost critical time and eventually dropped down to ninth as a result, but fought back to sixth, before a late spin dropped it one place to seventh. 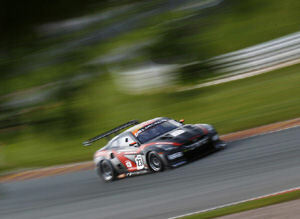 The No.8 Aston Martin of Turner and Mucke meanwhile lost one place during their pit stop and fell to fourth, only to clinch the final step of the podium in the final minutes as they passed the No.20 Nissan Sumo Power GT of Warren Hughes and Enrique Bernoldi, which finished in fourth position. The other Nissans took the chequered flag in sixth (No.22), eighth (No.21) and 11th (No.23). Speaking afterwards, Warren Hughes, who replaced Ricardo Zonta for the weekend due to the Brazilian being unable to get out of race commitments in his home country, said: "It's a bit of a shame that we couldn't hold onto a podium position right until the end, but I would certainly have taken that result at the start on a track that really isn't set up to suit the GT-R at all. I was struggling quite a lot with under-steer during my stint behind the wheel, whilst at the same time being pushed really hard by the Aston who was hot on my heels throughout - it was a tough job! That said, it just felt great to be back behind the wheel of the Nissan GT-R after enjoying a full season with Sumo Power last year, and it's a good achievement for Enrique and I to be top placing Nissan with all the stiff competition that there is amongst the ranks. Fourth on the grid sets us up nicely for tomorrow." Hughes' co-driver in the No.20 Sumo Power GT Nissan, Enrique Bernoldi, added: "The Nissan GT-R is a really big car for this type of track. Sachsenring favours smaller cars with a lower-centre of gravity, but the GT-R's power on the straights is great. I found that the tyre degradation wasn't too bad in my stint, which helped me to maintain my position whilst I was at the wheel, and then Warren did well when he came in to the car. Overall we did well and I'm happy - fingers crossed it all goes well in the Championship Race tomorrow." Several drivers were caught out by the tricky, undulating Sachsenring circuit, including the No.11 Exim Bank Team China Corvette which spun out of the race on lap five as Nicky Catsburg vied with the No.23 JRM Nissan GT-R for seventh place.